• Get repeated one-on-one coaching cutomized to your needs and skill level thoughout the day. • Free parking, unlimited bottled water and snacks are included. • Audio of all your work on mic is professionally engineered and emailed to you right after the workshop. customized to your level and goals. Your day includes 4 sessons of 1-on-1 coaching on-mic with 4 different coaches (here's who), 4 hours of workshops (Improv, Checklist for Success, and Backstage with the Pros), and all your audio sent to you to study. Plus you can stay to network, or join us for dinner afterwards! Our coaches are the cream of the crop in the Twin Cities voice over world, including agency owners, top agents, all the original voice acting instructors at them Guthrie, top talent with decades of experience, great directors, and more. Click here to see who's coming on February 28. This is a top 3 VO market outside outside the coasts, and our coaches have hundreds of years of combined experience in the industry. You get repeated personal attention from different top voice coaches thoughout the day. You work in small groups with scripts, exercises and direction are all customized to your specific skills, needs and goals. All your audio is recorded on site by one of our audio engineers, emailed to you, and then reviewed with you by phone after the Expo. We have tracks for working talent, beginners and intermediates. This is the cheapest, easiest way to get better at voice over fast. All workshops take place at our training center (map & directions), conveniently located just west of downtown Minneapolis. Free all-day parking. Free parking, free WifFi and unlimited bottled water and healthy snacks are provided throughout. Backstage Pass: 5:00-6:25pm Bring a friend free! Dinner: 6:35-8:30 (No purchase required, cost of dinner not included). Techniques to get you creative, loose and playful. In conjunction with New Reality Delivery. Get warmed up and have fun! Learn more here. If you choose extra coaching sessions, your schedule will be adjusted. You will not lose any on-mic time regardless of options chosen. Learn the secret of winning auditions with the first words you speak by using script analysis to create a dialog out of a one-person script to begin your performance, and to capture the listener’s attention before leading them into the story of the script. Begins with an acting warmup, overview of the day’s workshops and introduction to coaches. Here, whether you're a beginner or a pro, your coach (a working voice over pro) will have a customized set of scripts and approaches to help you work on your goals for the workshop in a small group with other students at a similar level. In this workshop, a new pro coach will join your group and and help you use what you’ve learned in the previous workshop. You’ll stay with your small group into the next workshop and the last coach of the day. Your last pro coach for the day will take you through some fun 2- and 4-person scripts selected according to your skill level, and help you hone your "real person" skills—one of the styles that gets the most work in the Twin Cities market and elsewhere. Spend over an hour with 5 top working talent, coaches and agents: ask questions, hear how to succeed, etc. 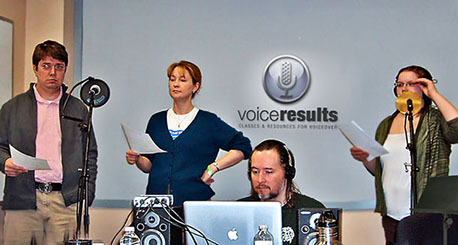 Bring-a-friend encouraged.This event packed the house at the 2014 Voice Acting Expo — don't miss it! Have a friend who just wants a free backstage pass? Send them here. Join us for Dinner in the Reserve Lounge • (a la carte menu available, dinner salads start at $8.95, stir fry from $9.95) • Dinner option available with any registration type. Your audio recorded on site by our engineers is classwork, and is not intended to be used in a demo. A professional demo takes hours with a coach and engineer in a sound studio devoted to one talent, and includes music tracks, and costs up to $1,500 in the Twin Cities (although we have deals with studios that can bring your cost for a demo under $600). Because of the popularity of these workshops, reservation is made upon payment, first-come, first served. For more about reservation and cancellation policies, please see our policies page.
. Free parking, unlimited bottled water and snacks all included.
. Audio of all your work on mic is professionally engineered and emailed to you right after the workshop. • These workshops have been recommended by LA and NY talent to their Midwestern friends.
. Coming from over 250 miles away? Some travel reimbursement available.
. We have worked with talent from all major Twin Cities agencies. • Unemployed? Several students have received training funding for our classes and workshops. Learn more here. ► Next Full-Day Workshop After This One: Coming soon!